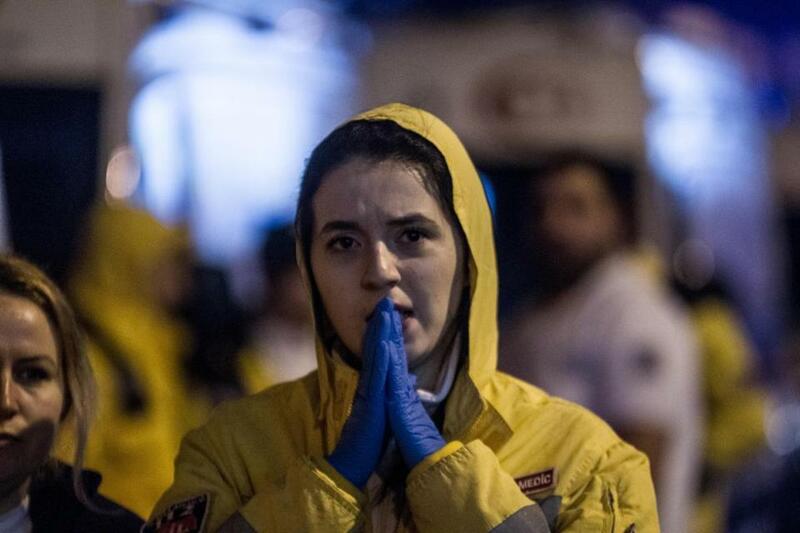 Victims’ relatives gathered Sunday near Reina nightclub in Istanbul. 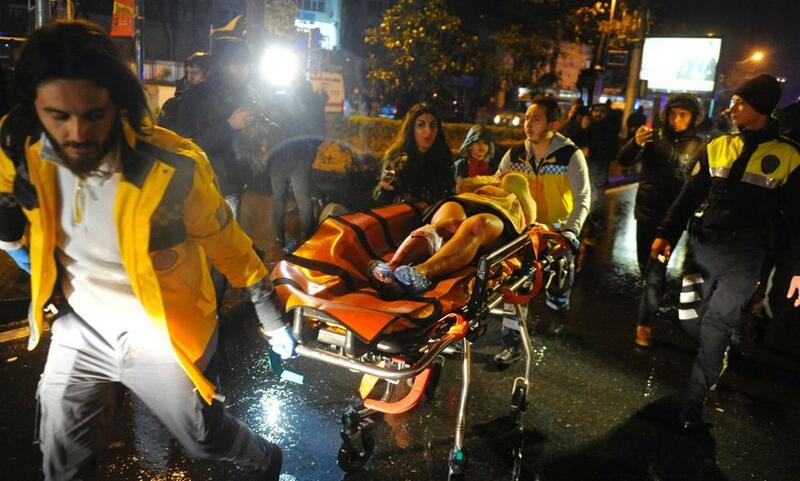 ISTANBUL — An assailant believed to have been dressed in a Santa Claus costume opened fire at a crowded nightclub in Istanbul during New Year’s celebrations, killing at least 39 people and wounding close to 70 others in what the province’s governor described as a terror attack. Governor Vasip Sahin said the attacker, armed with a long-barreled weapon, killed a policeman and a civilian outside the club at around 1:45 a.m. Sunday before entering and firing on people partying inside. He did not say who may have carried out the attack. ‘‘Unfortunately (he) rained bullets in a very cruel and merciless way on innocent people who were there to celebrate New Year’s and have fun,’’ Sahin told reporters. 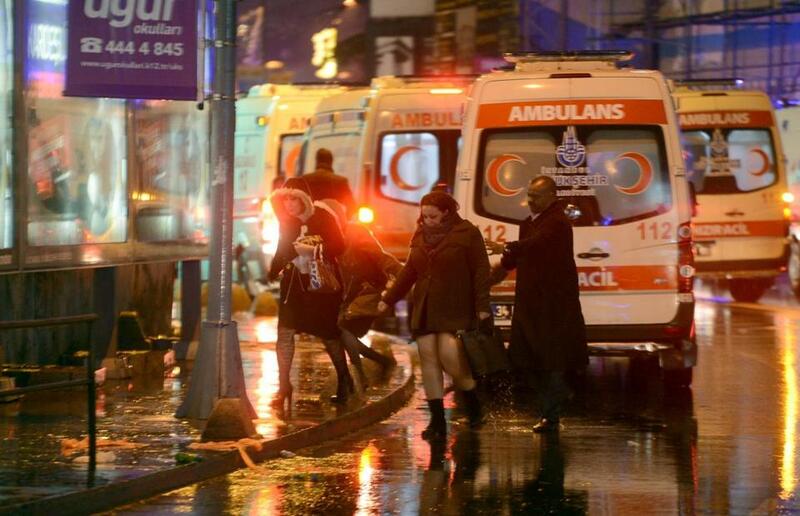 An assailant believed to have been dressed in a Santa Claus costume opened fire at a nightclub in Istanbul during New Year’s celebrations Saturday. ‘‘Our security forces have started the necessary operations. God willing he will be caught in a short period of time,’’ the minister said. At least 16 of the dead were foreign nationals, Soylu said, without providing information on their nationalities. Five of the victims were identified as Turkish nationals while authorities were still trying to identify 18 of the victims. At least 69 people were being treated in hospitals, four in serious condition, Soylu said. 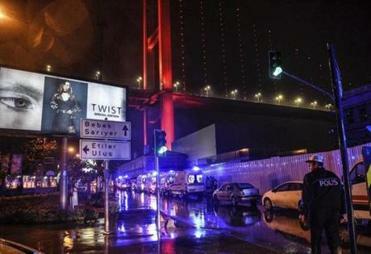 Some customers jumped into the waters of the Bosporus to escape the attack, the report said. ‘‘Before I could understand what was happening, my husband fell on top me,’’ she said outside Istanbul’s Sisli Etfal Hospital. ‘‘I had to lift several bodies from top of me before I could get out. It was frightening.’’ Her husband was not in serious condition despite sustaining three wounds. Police with riot gear and machine guns backed up by armored vehicles blocked the area close to the Reina nightclub, one of the most popular night spots in Istanbul. Several ambulances flashing blue lights arrived on the scene, some taking wounded to hospitals. The White House condemned what it called a ‘‘horrific terrorist attack’’ and offered U.S. help to Turkey. National Security Council spokesman Ned Price said the attack on ‘‘innocent revelers’’ celebrating New Year’s shows the attackers’ savagery. ‘‘Our thoughts are with victims and their loved ones. We continue to work to prevent these tragedies,’’ European Union foreign policy chief Federica Mogherini tweeted. 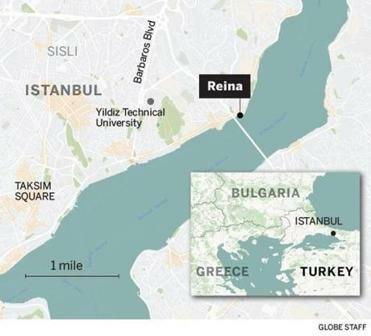 Turkish police secured the area surrouding Reina. The country has been rocked by a series of deadly attacks in 2016 carried out by the Islamic State group or Kurdish militants, killing more than 180 people. On Dec. 10, a double bomb attack outside soccer stadium — located near the Reina nightclub — killed 44 people and wounded 149 others. The attack was claimed by Turkey-based Kurdish militant group, the Kurdish Freedom Falcons. Nine days later, an off-duty Turkish riot policeman assassinated Russian Ambassador Andrei Karlov at a photo exhibition in the capital, Ankara. The government has suggested that a movement led U.S.-based Muslim cleric Fethullah Gulen was behind the killing — an accusation the cleric has denied. ‘‘Turkey will continue its determined and effective combat to root out terror,’’ Bozdag said on Twitter. 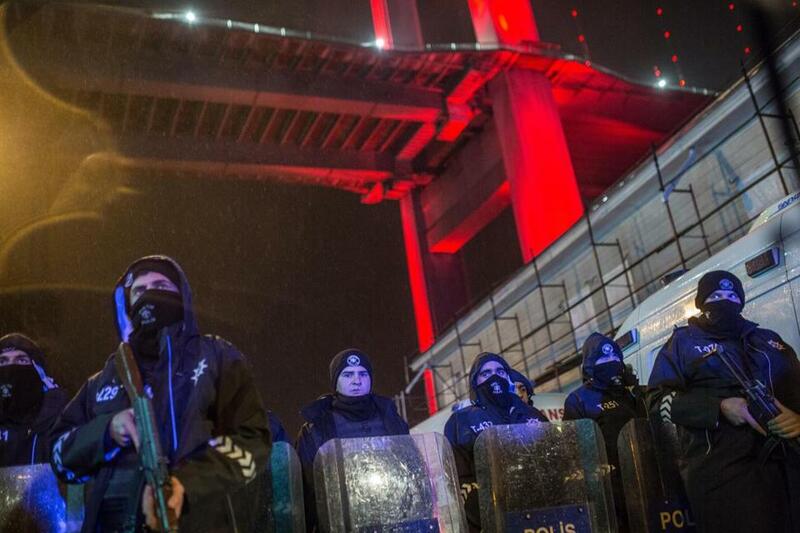 Security measures had been heightened in major Turkish cities, with police barring traffic leading up to key squares in Istanbul and the capital Ankara. In Istanbul, 17,000 police officers were put on duty, some camouflaged as Santa Claus and others as street vendors, Turkey’s Anadolu news agency reported. First aid officers carried an injured woman. 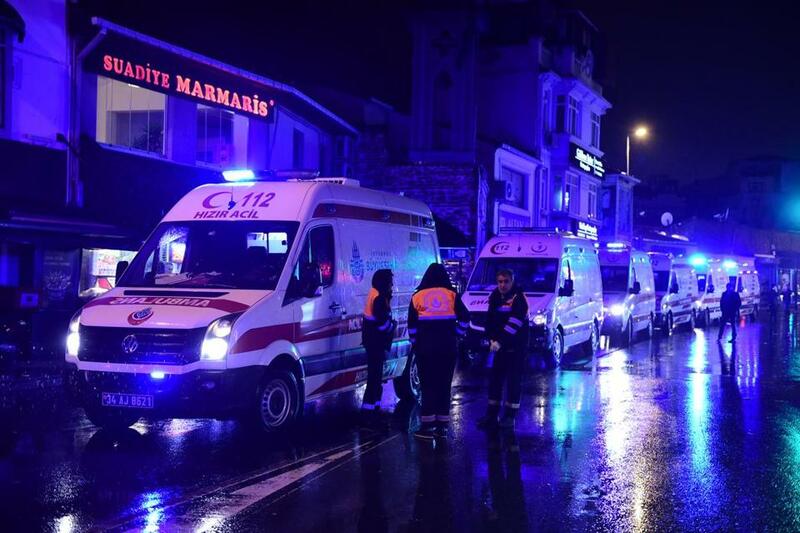 Ambulances at the scene of the Istanbul attack. Medics and security officials worked at the scene. 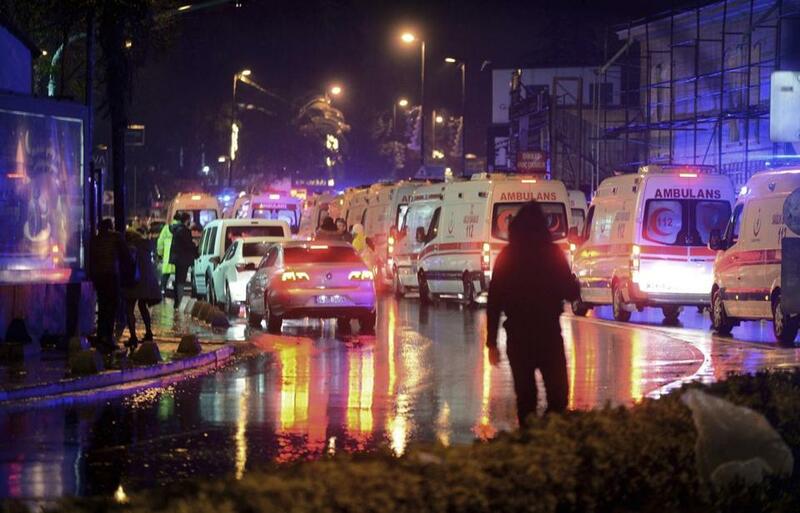 People fled as ambulances lined up for the victims in Istanbul. Associated Press journalists Dusan Stojanovic and Mehmet Guzel in Istanbul and Suzan Fraser in Ankara, Turkey, contributed to this report.